You all know I love using books in therapy! I've put in a lot of leg work on my latest book companion and I know it will benefit all of us - Less prep time for my busy SLP buddies and a host of benefits for the kids. Not only are books like this one rich with opportunities to hit speech and language goals, but they also offer students an extra opportunity for exposure to literature and text. I'm all about having fun in therapy, but why play one more round of Jenga or Candyland when you could get so much more for your time?! Keep reading about literacy-based therapy here if I haven't convinced you yet. 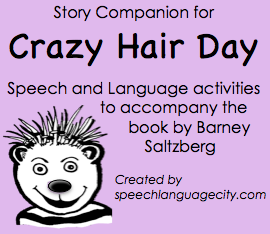 Crazy Hair Day is a cute story about an overly excited little guy who goes all out for crazy hair day at school. The only problem is that he mistakenly does his outrageous 'do on the wrong day! To make matters worse, today is picture day! The laughs of his classmates are enough to make him want to hide his wacky hair all day. Fortunately, when he has the courage to return to class for the photo, he discovers that his classmates are all wearing silly hats in solidarity for the picture. It is left a mystery who is behind the compassionate move, which opens up great opportunities for discussion about teasing, embarrassment, friendship, and making amends. My companion pack for Crazy Hair Day is available for purchase on TeachersPayTeachers. Please note that this product does NOT include the story and you will need to purchase or borrow a copy in order to use it fully. If it isn't already a part of your collection, borrow a copy from the library or consider purchasing an affordable copy on Amazon. Oftentimes you can also find a reading of the story on YouTube or similar sites, but this is not guaranteed. This companion pack is entirely grayscale for easy print and go therapy. The story itself is short but contains abundant opportunities to hone in on articulation and language targets. This makes it a perfect selection for mixed articulation/language therapy groups. Although some activities do not require reading, most are designed for readers, grades 1-4. The packet begins with an SLP guide, which serves as quick reference sheet highlighting possible articulation and language targets. It also doubles as a data sheet for a few language targets you can hit on the fly: prediction/inference making, vocabulary, and irregular past tense. Thoughtfully designed student sheets at the end of the packet extend the possibilities. Page 1: Over 50 potential articulation targets from the text are listed on the SLP guide: /k/ (25), /s/-blends (15), and vocalic /r/ (15). Pages 2-4: Student BINGO boards feature words from the text containing each of the targeted sounds. These pages provide an engaging way to get the artic-only students in your group tuned in to the story while also maximizing repetitions in meaningful articulation drill. As you read the story, the students listen for the target words, cover them on the BINGO sheet, and then whisper practice. Page 1: 14 irregular past verbs from the text are listed on the SLP guide with room for quick data tracking on up to 4 students. Cover the irregular past tense form as you read for an easy fill-in-the-blank task to target correct formation of irregular past verbs. Alternatively, use the irregular past tense BINGO sheet. Page 1: 13 story specific questions to tap prediction and inference making skills are listed sequentially on the SLP guide. Students respond orally to these questions as you read the book together. Pause at the listed page number to ask the question, then record correct/incorrect responses of up to 4 students. Page 1: 11 thoughtfully selected vocab words from the text are listed on the SLP guide, with room to record data for up to 4 students at pre-reading, in context, and post-reading intervals. Use your data to guide the selection of six targets for your students to log on their vocabulary pages. Page 7: A graphic organizer is also provided in the student pages. The organizer jumpstarts summaries by including transitional words and phrases above the boxes provided for story events. For students needing more scaffolding, try a sequencing task before summarizing. The SLP pre-fills the boxes, cuts apart, and assists students with ordering the sequence of events. Page 8: The character connection worksheet aligns nicely with the curriculum (making connections to the text) as well as common language goals (using rich vocabulary to describe character feelings, using complete sentences to explain reasoning). For an easy carryover activity, complete the top in group and send the bottom home for homework. Page 9: Finally, a worksheet designed to explore of theme of the story is provided in the student pages. The prompts walk students through the process of identifying the theme of a story (reflection on problem/solution and lesson learned by the character). Again, this activity aligns nicely with the curriculum as well as common language goals. Find more great resources at my TPT store. Thanks for your readership and your support!